Although English is the third most spoken language after Mandarin and Spanish, it is the most spoken second language in the world. 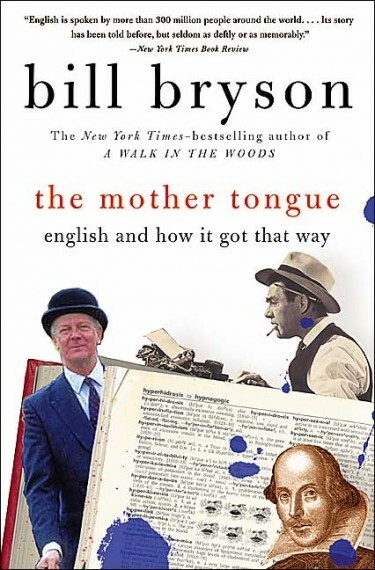 This is due to the power-brokers that speak it, its uniquely expressive vocabulary, and how it came to be, argues Bill Bryson in The Mother Tongue. What most immediately sets English apart from other languages is the richness of its vocabulary. Altogether, about 200,000 English words are in common use, more than in German (184,000) and far more than in French (a mere 100,000). This richness and wealth of available synonyms means English speakers can often draw shades of distinction unavailable to non-English speakers. The slight evolutionary change that pushed man’s larynx deeper into his throat, and thus made choking a possibility, also brought with it the possibility of sophisticated, well-articulated speech. One of the greatest mysteries of prehistory is how people in widely separated places suddenly and spontaneously developed the capacity for language at roughly the same time. It was as if people carried around in their heads a genetic alarm clock that suddenly went off all around the world and led different groups in widely scattered places on every continent to create languages. Italians cannot distinguish between a niece and a granddaughter or between a nephew and a grandson. The Japanese have no definite or indefinite articles corresponding to the English a, an, or the, and they do not distinguish between singular and plural as we do with, say, ball/balls and child/children or as the French do with chateau/chateaux. This may seem strange until you reflect that we don’t make a distinction with a lot of words—sheep, deer, trout, Swiss, scissors—and it scarcely ever causes us trouble. Bankrupt was taken literally from the Italian expression banca rotta, meaning “broken bench.” In the late Middle Ages, when banking was evolving in Italy, transactions were conducted in open-air markets. When a banker became insolvent his bench was broken up. We possess a number of sounds that other languages find treacherous and daunting, most notably the “th” sound of the and think, which is remarkably rare in the world at large, or the “l” sound that Orientals find so deeply impossible. No other language in the world has more words spelled the same way and yet pronounced differently. Consider just a few: heard, beard, road, broad five, give… Almost everyone agrees that English possesses more sounds than almost any other language. Chinese writing is immensely complicated. To this day in China, and other countries such as Japan where the writing system is also ideographic, there is no logical system for organizing documents. Filing systems often exist only in people’s heads. If the secretary dies, the whole office can fall apart. Colonel is perhaps the classic example of this orthographic waywardness. The word comes from the old French coronelle, which the French adapted from the Italian colonello (from which we get colonnade). For a century or more both spellings and pronunciations were commonly used, until finally with inimitable illogic we settled on the French pronunciation and Italian spelling. English grammar is so complex and confusing for the one very simple reason that its rules and terminology are based on Latin—​a language with which it has precious little in common. In Latin, to take one example, it is not possible to split an infinitive. So in English, the early authorities decided, it should not be possible to split an infinitive either. But there is no reason why we shouldn’t, any more than we should forsake instant coffee and air travel because they weren’t available to the Romans. Other authorities, in both Britain and America, continue to deride the absolute use of hopefully. No doubt the reason hopefully is not allowed is that somebody at The New York Times once had a boss who wouldn’t allow it because his professor had forbidden it, because his father thought it was ugly and inelegant, because he had been told so by his uncle who was a man of great learning . . . ​and so on. Stuart Berg Flexner, the noted American lexicographer, suggests that the average well-read person has a vocabulary of about 20,000 words and probably uses about 1,500 to 2,000 in a normal week’s conversations. [Another] puts an educated person’s vocabulary at about 15,000. Of all the new words to issue from the New World, the quintessential Americanism without any doubt was O.K. Arguably America’s single greatest gift to international discourse, O.K. is the most grammatically versatile of words. It is a contraction of the expression “oll korrect,” often said to be the spelling used by the semiliterate seventh president, Andrew Jackson. Putting aside the consideration that without America’s contribution English today would enjoy a global importance about on a par with Portuguese, it is not too much to say that this [negative attitude towards American English] is unworthy of the British. Mandarin Chinese, or Guoyo, spoken by some 750 million people, has twice as many speakers as any other language in the world, but see how far that will get you in Rome or Rochester. Some cultures don’t swear at all. The Japanese, Malayans, and most Polynesians and American Indians do not have native swear words. Manchester University in England studied swearing by Romans and found that they had 800 “dirty” words (for want of a better expression). We, by contrast, have only about twenty or so, depending on how you define the term. The suggestion that English will evolve into separate branches in the way that Latin evolved into French, Spanish, and Italian seems to me to ignore the very obvious consideration that communications have advanced a trifle in the intervening period. Movies, television, books, magazines, record albums, business contacts, tourism—all these are powerfully binding influences.